(7/22/2011) Erate Exclusive - The booming rental market has prompted a new quarterly report on markets yielding the best investments in the single-family home (SFH) rental sector. The effort comes on the heels of the National Multi-Housing Council's (NMHC) latest "Quarterly Survey of Apartment Market Conditions" for the first quarter this year, which found the so-called "Market Tightness Index," at 90. That's as high as it's ever been, with nearly 80 percent of surveyed apartment firm executives reporting tighter markets (higher rents, fewer vacancies), according to the survey. But that's just the apartment sector of the rental market. The SFH rental market is likewise enjoying a similar boom, according to the first-ever quarterly "HomeVestors-Local Market Monitor Best Markets to Invest in Rental Property (BMIRP)" report. BMIRP estimates that approximately 14 percent of single-family homes in the nation are retained as rental properties and the two companies say there is no other regularly produced, reliable national ranking of hot SFH rental markets. 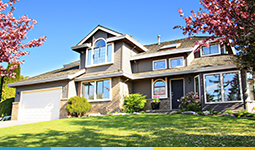 HomeVestors of America, Inc., is a franchisor also known as WeBuyUglyHouses.com. Its franchisees buy hard-to-sell, distressed properties for cash, rehabilitate them and then re-sell ("flip") and or rent the homes. Returning stressed properties to the market removes blight, helps reduce crime and improves communities, while providing affordable housing opportunities for first-time homebuyers and renters. 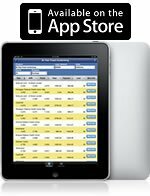 Local Market Monitor, is a real estate market number cruncher offering statistical analyses and forecasts. BMIRP reports the expected performance of single-family rental homes and produces a list of the 100 top markets. BMIRP rankings show the extra return, or risk-return premium, that an investor must demand from a rental property in a local market. The risk-return premium can be added to the regular capitalization rate to produce a risk-adjusted cap rate at full occupancy for a local market. The return can be rental income cash flow, appreciation or both. Risks include the potential for future home-value drops. "We're pleased to have developed this ranking system with Local Market Monitor to help investors in single-family rental property identify opportunities and gauge potential local market investment performance relative to the national average and other markets," said David Hicks, co-president of HomeVestors of America, Inc.
Like other real estate market analyses, forecasts and market ranking reports, BMIRP is no guarantee of how a given investment will actually pan out. "It is an objectively determined analytic tool intended to help inform real estate investors interested in property investment opportunities," according to HomeVestors. Just as appreciating owner-occupied housing markets share common indicators, so do top markets for SFH rental property investments. The highest BMIRP ratings are in markets where home prices have fallen substantially, including Las Vegas, Detroit, Tampa and Phoenix. Home prices in these markets are below-average, making turning empty homes into viable rental properties relatively easy, according to HomeVestors. 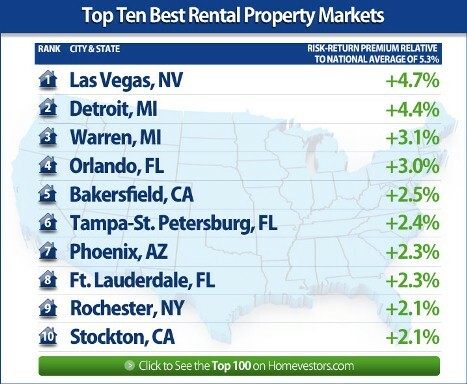 However, the top BMIRP markets come with the extra risk of high vacancy rates -- 12 percent in Las Vegas, 19 percent in Detroit, 9 percent in Tampa, and 13 percent in Phoenix. A closer looks reveals other factors common to top BMIRP locations. For example: • Las Vegas — Jobs continue to dwindle, unemployment stands at 12 percent, home prices are down 45 percent and rents are off 10 percent since the peak in 2006. Much of the large workforce in Sin City's casino industry consists of renters. The home ownership rate is a low 55 percent. • Detroit — The recession bottomed out a year ago in Motor City and unemployment remains high at 11 percent. The population is down 4 percent since 2006. • Tampa — Cigar City home prices fell 10 percent in the last year due to the over-supply of investment properties built during boom times in this retirement town. There is some renewed service industry job growth, but home ownership is down 5 percent since 2007. • Phoenix — In a city rising again, jobs are growing after a very deep recession. Population growth is up 8 percent since 2006. Still a bit singed, The Valley of the Sun suffers home prices 40 percent below 2006 levels and rents down 8 percent, during the same period.